From my perspective, the Spanish Village Foundation began with a message on my cell phone. The request was brief, straight forward and simple enough: a meeting over coffee early in the morning. When I called back to confirm my availability, it struck me somewhat odd that my questions regarding the intended subject of this proposed meeting were never really answered. In fact, the situation was only made all the more mysterious when my recommended meeting location of Café Calypso was declined because it was “too public and people might start to ask questions.” I suppose I could have insisted upon more information before agreeing to the request, but given the desire to remain covert, I did not think any additional information would be provided. The caller was none other than Mike Cotter, the former president of the San Clemente Historical Society. The requested meeting was in early December 2008 at the home of Raad Ghantous, another prominent citizen of San Clemente. At the meeting, Mike and Raad explained to me an idea that they had been working on for a number of months to create a new San Clemente organization that would be “all positive all the time.” San Clemente is a treasured community, unique, full of charm and with a populace determined to keep it that way. With Measure W and a divisive city council election in the rear view mirror, the concern was that the city had broken into different factions and was at risk of fracturing. The overriding desire was to find a way to mend any wounds and remind the community that San Clemente is a special place and worth preserving. In fact, the timing was optimal as the new mayor had just assumed her new post with the positive message that the community should work together. 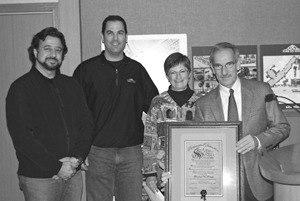 Mike and Raad acknowledged that other organizations in town had programs that worked to promote targeted aspects of the community, such as the Chamber of Commerce with their Person of the Year or the Beaches, Park & Recreation Foundation and their efforts to facilitate the building of Courtney’s Sandcastle, but none of these organizations were focused exclusively on highlighting San Clemente as a whole. The desire was not to supplant or assume those programs created by other groups, but rather to stake out new territory and to work in tandem. With that explanation provided, Mike and Raad then extended an invitation to be a founding father of this organization. In response I had three simple questions. What would we call this new organization, what is its intended mission statement and finally what kind of programs would this new non-profit organization undertake? The answers to these questions were simple and straight forward: that is something we need to consider as a group. The answer to the first question was probably the easiest. Because the organization was to focus exclusively on San Clemente’s positive aspects, we wanted a title that tied to the community and was unique in nature. The three of us believed in the idea of preserving what Ole Hanson had originally called the Spanish Village, we agreed upon the name of the “Spanish Village Foundation.” We all thought it served as a reminder of our past and could also serve as a guidepost of the city’s future. And with that, our new organization was founded, with Mike, Raad and me as proud fathers each. In the weeks that followed, we met on a regular basis and worked to find answers to my other two original questions. “Recognize, Celebrate and Promote the Positive Aspects of San Clemente” was ultimately adopted as our motto. Raad even created a new logo, which we readily adopted. But determining what kind of programs we were to operate, with the core purpose of promoting the positive aspects of the city, is where we focused most of our brainstorming efforts. The first proposal adopted and implemented was the “Proclamation of Distinction.” The proclamation of distinction can be awarded in eight categories: Arts & Literature, Business & Commerce, Community Service, Education, Environment, Government, Lifetime Achievement and Sports & Competition. Our focus was to recognize the efforts of those individuals who have worked to improve the community but may not have received acknowledgement or accolades for their efforts. In 2009, we gave out one Proclamation of Distinction for each category. In its simplest terms, the Proclamation of Distinction is an award with a heartfelt crafted accolade. But to the recipients of the award, we have seen similar reactions suggesting much more. Some have stood noticeably taller while others fought back tears, but all gleamed with pride and excitement when we recognized them. At first this surprised us and then humbled us as it validated to us the need to recognize San Clemente’s unsung heroes. Our second program created was the Spanish Village Foundation Spring Photo Contest, with a first place award of $1,000. With a nominal entry fee, one could enter a photo that they believe best represents the phrase “Celebrate San Clemente.” The number of entries received in a short time frame was well beyond our expectations, with entries received from as far away as Connecticut. We put the photos on display throughout town at various business establishments with a phone number and Internet site set up for the public to vote on its favorite photo. Now firmly into 2010, we have launched the Second Annual Spanish Village Foundation Spring Photo Contest. The theme of this new contest is “My San Clemente.” We are running this program in much the same manner, but this time we are expanding the pool of eligible participants. At the suggestion of a local parent, we have eliminated the requirement that all entrants must at least eighteen years of age. While we have created two successful programs, we remain in a perpetual state of brainstorming for additional ideas. Shortly after our founding, we added another member to our board, Candy Haggard, a former Mayor of San Clemente. Her presence and participation only serves to heighten our profile and reflects our belief that we have hit the right chord with the community. In addition, with her leadership, we now have other programs in the works, but they remain in the “quiet phase” of development and we are working to announce them in the immediate near future.